We were delighted to welcome Andy and Lindsay Curtis back to Great British Kitchens & Interiors, some years after we’d first fitted a kitchen for them. The family had recently moved to a new home in Beckenham and were looking for the same bespoke service to create their new family kitchen. The previous owners’ kitchen had become a little tired with age and didn’t function as well as it should for the Curtis family of four. Andy and Lindsay wanted to breathe new life into the space, maximising worktop areas as well as storage, and incorporating something ‘quirky’ to make it feel like a very personal room. The kitchen and adjoining dining area were separated by a dividing wall. Initially we planned to remove the wall, opening up the full space. However, at a late stage, it was decided that the wall would stay, so our designs were swiftly changed to accommodate this. We retained a good feeing of flow between the two rooms, with the wall allowing us to include even more storage and worksurfaces than were originally planned. 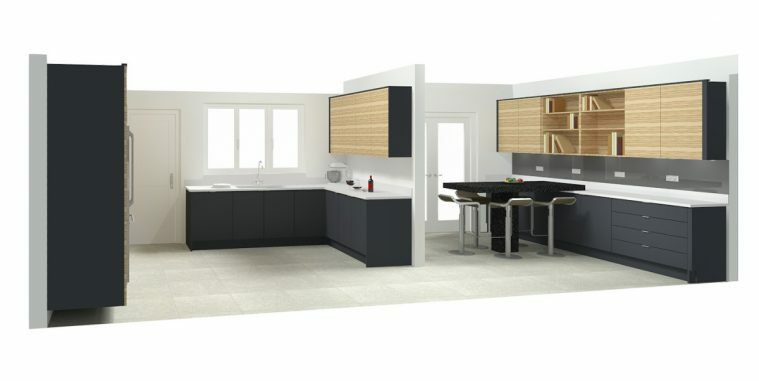 Looking around the kitchens in our showroom, Lindsay and Andy were struck by our olive ash and anthracite display – and this ended up being their choice for the kitchen. We used a combination of olive ash veneer and HDF (high density fibreboard) painted in ‘anthracite’ to create the kitchen cabinetry and bookshelves. Where we installed olive ash doors these were trimmed with anthracite to bring out the fabulous colour of the ash. We also used back-painted glass splashbacks in anthracite. These give the design an additional depth and are a very practical, wipe-clean solution – particularly helpful behind the hob. We used pure white quartz worksurfaces throughout the two rooms, which provided a striking contrast to the anthracite paint and prevented the rooms feeling too dark. The breakfast bar in the adjoining room was constructed from steel-grey, “leather” style granite. We used mid-height cabinets painted in anthracite to house two Miele ovens. 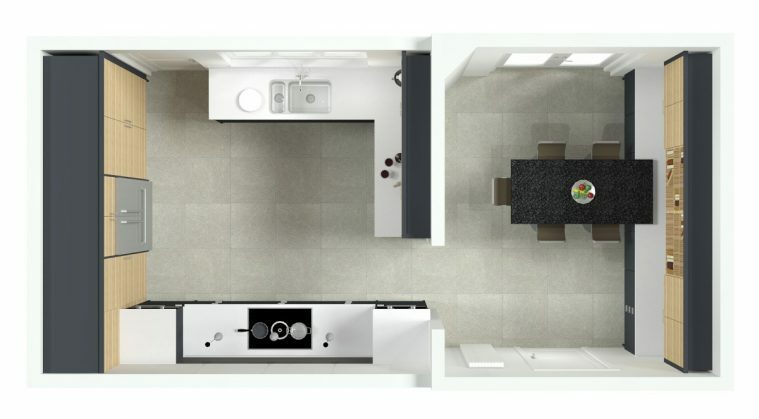 These mid-height units are becoming increasingly popular as they are less imposing than full-height units, emphasising the open feel of the kitchen. 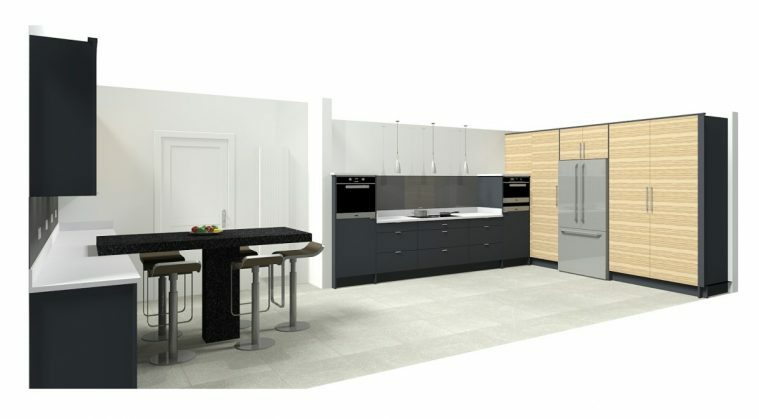 Full-height cabinets were used around the large Fisher and Paykel ‘Trilogy’ fridge and freezer. Inside these cupboards we’ve included a corner chef’s larder, providing ample storage space, the washing machine and tumble dryer, plus a utility cupboard. You’d never know they were there! The Trilogy fridge was fitted without the usual water dispenser, to maintain the minimalist feel which Andy and Lindsay desired. In addition to this and the two Miele ovens, we also fitted a BORA hob with its integrated extraction system and a Quooker boiling water tap. The mid-height units either side of the hob (and the lack of an overhead extractor, thanks to the BORA system) allowed us to create a neat design feature by suspending lighting over the hob. This looks great and is also an eminently practical feature for the cook. The Amtico flooring was installed under our guidance by the team at AJ Rogers & Sons, who we frequently work closely with. The resulting kitchen has a clean, linear, almost minimalist appearance. The natural wood combined with the dark anthracite paint gives the room an ageless feel, providing the Curtis family with a kitchen which will last for years – both in terms of the quality of construction and the longevity of design. We had used GBK&I to install a new kitchen in our old house 11 years ago, so we knew that their work is of a high quality, they are easy to do business with and they deliver to plan and budget. For this reason, we engaged Vince and Jack to build our new kitchen in our new house. Vince and Jack were very responsive to spec requirements, flexible and came up with some great ideas. They are both very professional and friendly so engender trust which is important when you are going to spend a lot of money. As before, we are delighted with our new kitchen and the service provided by GBK&I. There are invariably a few minor snagging issues after such a big job, but Jack and Vince sorted these out very quickly, no problem. The workmen we had around were respectful, tidy and friendly so no problem with them being in your house at all. Visit our showroom to discover our ash and anthracite display for yourself and how this could bring an effortless, contemporary style to your kitchen. We work throughout Kent and south east London. For more design inspiration take a look at our case studies for kitchens in Bexley, Hayes and Halstead.